Why Use Vacation Packing List? Some people never pack a bag without using vacation packing list. Some even go as far as saying that you should not pack an item if it is not on the packing list. While others never bother to use one... and still manage to pack their bag somehow. B for Bag view is that packing list for travel is not strictly necessary but that it can be very helpful when packing for a trip. Travel packing lists should though never replace the good old common sense. If something is not on your packing checklist, you should still take it if you need it, or even if you just want to bring it along. There are many benefits of using packing list for travel. Maybe most importantly because travel packing lists can take the stress out of packing. Packing checklist means you are less likely to forget any necessary items (must have). It can also remind you of items that can be useful or fun to bring on your vacation (nice to have). Lists can help you to stay organised when packing, just go through the packing list for travel from top to bottom, marking the items as you go along. All this means packing should take you less time... just to mention few of the benefits of using packing checklists. Feel free to print any packing list template that fits your travel needs. If you travel frequently, you might be interested in downloading our Free Vacation Packing Guide. 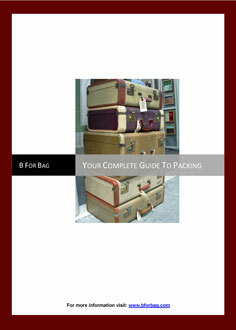 It offers practical travel packing tips about what to pack and how best to pack it. It explains the most popular luggage packing methods in details (with photos) and includes all the above vacation packing lists.